You may have noticed some of your social media chums sharing photos of new tattoos in the shape of a semi colon lately. But this isn't just a plug for an under-appreciated piece of punctuation; your mates are making a really important statement. The Semicolon Project is an organization raising awareness of depression, anxiety, self-harm and suicide by encouraging people to draw semicolons on their wrists. Some people are just drawing theirs in pen, but others are going all out and getting a tattoo. "Join the fight and stand up for YOU or anyone you know who has depression, anxiety, has self harmed or has contemplated suicide and help our peers, our friends and our family know that we speak up for them and that we stand up against Mental Health and the stigma that's attached to it." 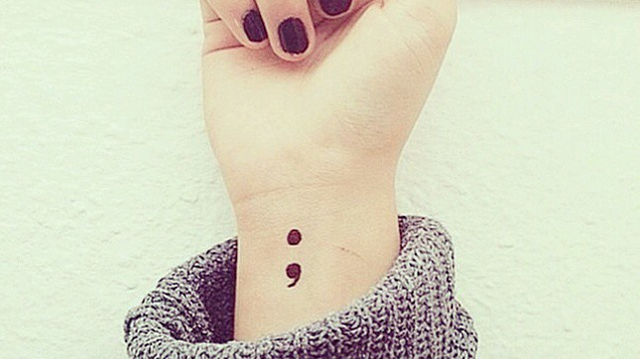 One Instagram user posted about getting her semi colon tattoo to mark the end of her suicidal thoughts. "Tomorrow I will be getting a semicolon tattoo to symbolise my courage of over coming the darkest time in my life && I'm so grateful for those who have stuck by me. I will always suffer from depression but the self harm && suicide ideation has finally ceased. The sentence of my life is not over;"